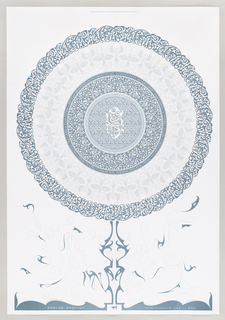 See more objects with the tag churches, men's clothing, script, interlaced, burial, rosettes, calligraphy, Arabic, kufic. See more objects with the color peru sienna tan sienna sienna or see all the colors for this object. This is a Fragment. 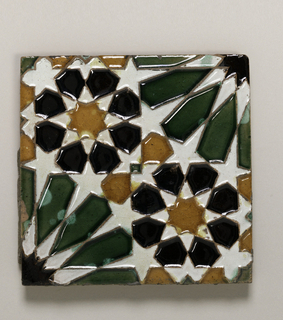 It is dated 1250–74 and we acquired it in 1902. 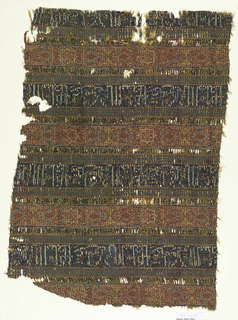 Its medium is silk, gilded vellum on silk core and its technique is plain weave with complementary wefts (taquete). It is a part of the Textiles department. This Spanish textile is a fragment of a mantle discovered in the tomb of the Infante Don Felipe of Castile (1231-1274) at the church of Santa María la Blanca in Villalcázar de Sirga, Palencia. Felipe famously led a noble rebellion against his brother Alfonso X, king of Castile, and eventually decided to seek asylum in the Nasrid Kingdom of Granada. 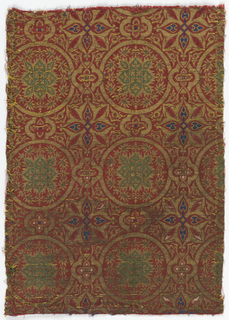 Felipe may have acquired this sumptuous mantle while residing at this center of silk production. 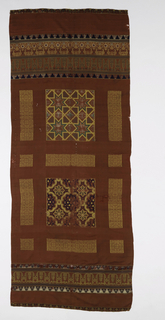 A tunic with a similar geometric pattern was also found in his tomb, and other Islamic silks have been found in the tombs of Christian nobles in Iberia. 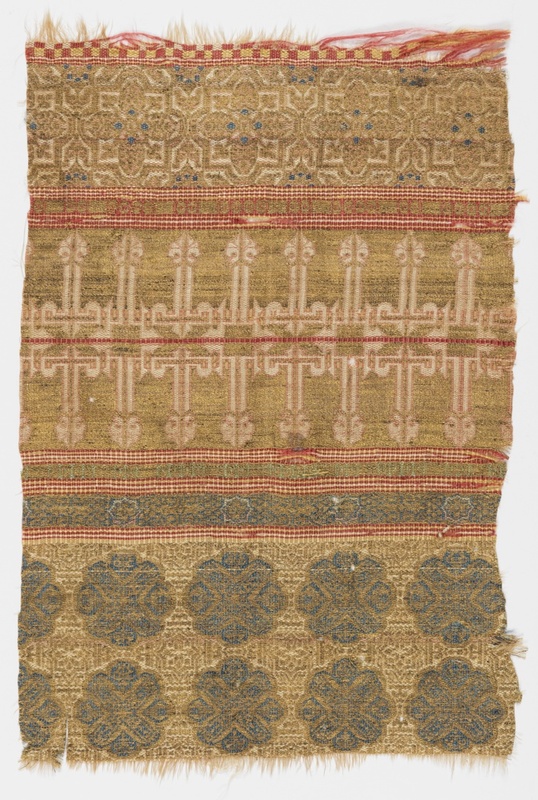 The pattern of this textile consists of bands of ornamented rosettes and a central row of Kufic script reflected over a horizontal axis. 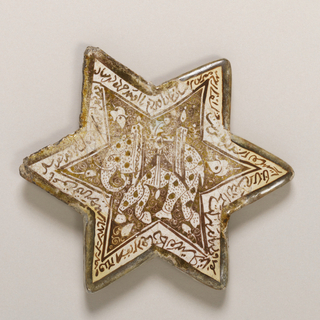 This stylized inscription may repeat the word “barakah,” which invokes blessings. The registers of decoration are reminiscent of the carved walls and mosaics of Islamic architecture, and the white patterning in the bottom register gives the impression of traditional lobed arches and tapered columns. Granada is renowned for its architecture, especially the sultan’s palace Alhambra, finished within 60 years of the burial of Felipe. This object was featured in our Object of the Day series in a post titled Words to be buried in. glazed, slip-decorated earthenware (cuenca technique).